Familiarity breeds contempt but it can also lead us to looking at our surroundings quite casually. How much do we really notice? One of the favourite parts of our local heritage is the Peak Forest Canal and particularly the locks. How many times have you walked up (or down) the locks? You must know every inch. Or do you? Let’s take a walk up the flight of locks and look at some of the aspects that together make our canal so interesting. Some are well known, some might be new to you and a few are mysteries to almost everyone. There is some dispute as to which locks on the English canal system are the highest or the longest or the steepest. The Bingley Five Rise goes up 59 feet with a gradient of one in five over a distance of 320 feet. Foxton Locks in Leicestershire have ten locks in two flights. Caen Hill Locks on the Kennet and Avon Canal has 29 locks over two miles, lifting the boats a total of 237 feet, with the very photogenic middle section of sixteen locks all in line, one above the other. In comparison there are sixteen Marple Locks, rising a total of 209 feet in just over a mile. It might not be the highest or the longest or the steepest but it is certainly the most attractive. More importantly, it is a very elegant engineering solution to a difficult problem. They are conventional locks, allowing boats to pass each other between locks which minimises the use of water compared to staircase locks. Moreover, Outram’s design curved round a shoulder of high ground with the east side of the canal on the downhill side, thus avoiding significant earthworks. The pounds between the locks are well designed, being much wider than is needed to allow boats to pass, because the extra width is used to store water. We’ll start this side of the aqueduct and follow the towpath alongside the first eight locks. Before you begin, pause for a moment to read the plaque describing the aqueduct. In particular it mentions Cyril Boucher who was instrumental in the reopening of the Peak Forest Canal in 1974. Pass under the steel skew bridge to the wide pool beyond. This winding hole was originally the head of navigation or terminus of the canal before the locks were built. Then it was used for turning by boats that only went to the Queens Hotel and later, for boats delivering to Aqueduct Mill. Engineers’ Wharf, on the far side of the winding hole is used by the Canal & River Trust for maintenance work on the canal. It looks a mess now but it has probably always looked a mess as this area was used for maintenance from the very beginning. Until recently there was both a carpenter’s and a blacksmith’s workshop there, the ruins can still be seen. However, the tithe map of the 1850s shows several buildings at the wharf, at least four distinct structures. For a time this area was also the terminus of the tram way once the aqueduct was complete and before the locks were constructed. The wagons, which had come down from the upper part of the Peak Forest Canal, would be unloaded here and their cargo transferred onto boats. Even before the aqueduct was completed and it was still under construction, it is thought that the tramway crossed the Goyt on a temporary structure to join the canal on the other side. Bottom Lock change bridge is where the towpath changes sides but it is much wider than is usual with change bridges because it was also where the tramway crossed the canal to get to Engineers’ Wharf. The house alongside the bridge is Aqueduct House. (above) This was built by the MS & L Railway, the owners of the canal, for some of their more senior employees in the area. It was constructed in about 1862, probably on the site of an existing house or cottage. This would probably have been a cottage for the wharfinger of the temporary tramway and, when that closed, for a lock-keeper. In her novel “By the pricking of my thumbs” published in 1968, Agatha Christie tells of a picture of a house by a canal that Tuppence uses as a clue to solve the mystery. It is believed to be Aqueduct House although we cannot prove it. The trail now follows the towpath towards Lock 1. All locks are numbered from the bottom of the flight as it was thought unlucky to do otherwise. Just before the lock a milestone can be seen in the wooden fence bordering the towpath. This is an official Peak Forest Company milestone, marking seven miles from the start of the canal at Portland Basin in Ashton. The PFC milestones were originally placed every half mile for the purpose of charging canal users and many of them are still in place. They have a distinctive shape with a rounded top over two shoulders. All the locks are similar in concept and design though they do differ in detail. The upper, or head, gate controls the flow of water into the lock chamber by paddles which can be raised and lowered. The lower, or tail, gate allows water out of the chamber with similar paddles. The gates themselves are opened and closed with beam attached to the top of the gate. All locks have the facility to pass surplus water down to the next level and there is a footbridge on every lock at the tailgate, allowing access to both sides of the lock. An unusual feature on these locks is a carved keystone in the arch supporting this pathway. Although they are now badly eroded it is obvious that the master masons followed the example of their medieval predecessors in carving caricatures or gargoyles. The cottage at Lock 1 is Bottom Lock House and this was built in 1835 for the lock-keeper when traffic from the newly built Macclesfield Canal augmented the Peak Forest traffic. Opposite Lock 1 a cutting was made from the main railway line to sidings alongside the canal when the railway was being built in 1862. Material could be brought in by rail and transferred to canal boats for onward transport. Similarly cargo from the canal could be loaded onto railway wagons. There were two sets of sidings. The pound above Lock 1 was lower than the siding, making it easier to transfer from rail to canal. This was complemented by the southern two sidings, which ran alongside the pound above Lock 2. These were below the level of the canal so the wagon floors would be about level with the wharf and the canal boat alongside. Although it was originally planned as a temporary installation whilst the railway was being built it was found to be such a useful interchange between the canal and the railway that it was retained and developed. The short flight of steps on the tailgate end of Lock 2 (below) are a particularly good example of a feature on all the locks. These steps appear to lead nowhere although they are alongside a small stone platform built into the masonry. We are not sure how it was used exactly but it was employed when there was just a single operator on each boat. When either entering or leaving the lock the boatman would step onto the platform, climb the steps and then operate the lock gates before returning to the boat. Originally there was an ancillary wooden platform that could be attached to the masonry to make the manoevre easier. There are several fragments of the substantial boundary wall which originally separated the towpath from Brabyns Park. The whole wall is topped with semi-circular coping stones, demonstrating the quality of workmanship which is evident throughout this flight of locks. The gargoyle on the tailgate of Lock 3 is one of the better preserved carvings but still only just recognisable as a face. Alongside the lock a line of sets can be seen at the edge of the grass verge. They used to stand out rather more but layers of gravel laid over time to improve the towpath have concealed the sets. These mark the site of a cottage built for a lock keeper in 1835. It appears to be only one room deep but old photographs show a wider house so the footings have been lost over time. Just beyond the lock keeper’s cottage there are 23 stone fence posts just off the towpath, also marking the boundary with Brabyns Park. Two holes in each post for rails. There seems to be a standard distance of about eleven feet between each post, allowing timber rails to be cut for it elsewhere. These posts go down the slope and in total there are nearly seventy. Between Lock 3 and Lock 4 there is a small marker stone set in the ground with the number 11 inscribed on it. This is a much more recent artefact as it is part of a nature trail developed by pupils of Marple Ridge School in the early 1980s. Also at approximately this point, the railway passes under the canal with less than three feet between the top of the tunnel and the bottom of the canal. Past Lock 5, the boundary wall is now capped with triangular stones rather than the semi-circular ones seen earlier, and this design is predominant all the way to Station Road. Another mystery. Is there a reason for the change in design or was it just on the whim of the foreman mason in charge of building this section of wall? On the other side of Lock 6 there was a lock-keeper’s cottage, built in 1834. 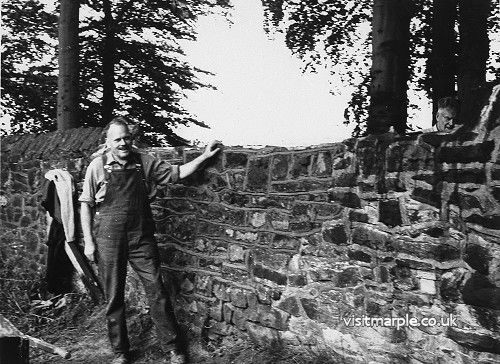 Called Glen Cottage, it was demolished in 1962 but there are still some traces left such as the garden gate posts shown in the photo and a few low walls. At the further end of the pound for Lock 6 there is a patch of water beside the towpath, now called Willow Pond. This was originally part of the pound and the towpath went around the area in a curve on an embankment. Over time it was found that the extra water was not needed to operate the locks effectively so the towpath was diverted onto a straighter path and that section of the pound was cut off, gradually silting up. At Lock 7 the ancient Seven Stiles footpath crosses the canal. This footpath originally ran from Marple Hall to Marple Bridge. Although it has been diverted many times in the last two centuries it shows remarkable resilience and is still a very important route for people in the Ley Hey area, area and beyond. Just below the lock there is another of the nature trail markers, number 10, and number 9 is a short distance further on. On approaching Lock 8 a more important milestone appears. This is the PFC mark indicating 7.5 miles from Portland Basin. It is slightly smaller than the mile stone, as befits a half mile stone but it is proof that you have walked half a mile from Lock 1. Lock 8 is significant because the gargoyle(left) here is supposed to be that of Thomas Brown, the canal engineer. We have no way of knowing if it really is a good likeness but the story that has been handed down is that he was a tough manager and drove his men hard, partly because of the inadequate finances of the company. Whereas the ordinary labourers could only vent their frustrations in private, the stone masons were able to make a more public gesture. This is the only lock where there is a remnant of the method by which the boatmen left and then reboarder their boats at each lock. The ironrod held a wooden platform in place to assist the manoevre but we are not clear about the details. Can anyone help? For the technical minded Lock 8 is of interest because of the V-shaped section in the overflow channel. This is used as a flow meter to measure the water volumes. Finally, there is one more nature trail marker, just before Station Road. This one is illegible but it must be number 8. And that is as far as you can go, at least for the present. The upper eight locks have suffered several problems recently and they are being given a very large (and very expensive) makeover. Let’s hope that when the barriers finally come down that the historic artefacts are still in evidence. Perhaps then we can have another walk up the locks. Lock 3: Just beyond the lock keeper’s cottage there are 23 stone fence posts just off the towpath, also marking the boundary with Brabyns Park. Two holes in each post for rails. There seems to be a standard distance of about eleven feet between each post, allowing timber rails to be cut for it elsewhere. These posts go down the slope and in total there are nearly seventy. This gent, shown here at Lock 9, was a Lock Keeper who passed away in 1978. 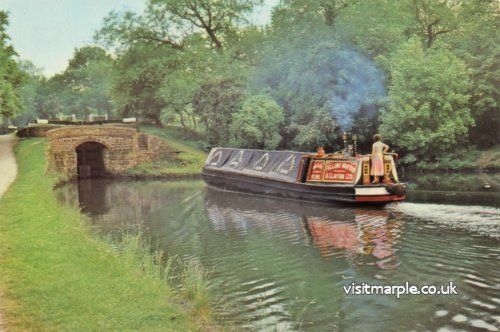 Marple Locks at 25 speed !